So I approached Where She Went with almost equal amounts trepidation and excitement. It's hard to follow up an ending like the ending of If I Stay. In many respects, I felt like the mere existence of a sequel might mar the beauty of the first book. I just . . . I loved how it ended so much, I wasn't at all sure I wanted to know what happened next. And if you know me at all you know how hilarious that sounds. I always want to know what happens next. I regularly fill my life with beloved series I can't quit. But I am also an enormous admirer of standalone volumes, particularly those featuring a judicious and perfect ending. Such was the case with If I Stay. But the tenor of my emotions for Mia and Adam by the end of that book ensured that I wouldn't be able to stay away from a follow-up in the end. Especially as that follow-up was set three years later. So I only lasted about 24 hours in between finishing the first book and plunging into the second. A warning: If you have not yet read If I Stay, I suggest doing so now before proceeding any farther. It really is worth it, and there is simply no way to discuss the sequel without ruining the surprise both books have in store. Also, the nature of my feelings regarding this one demand a discussion of the ending. So. You have been warned, yes? It's been three years since Mia awoke to find Adam there waiting for her. And, as happy as she was to see him (and he her), it turns out three years is more than enough time for everything to fall apart. At first, everything seemed fine. More than fine. She was awake. She was alive. She had Adam there to help her through her recovery and convalescence. She had an acceptance letter from Julliard. But none of those positives were enough in the end. They weren't enough to outweigh the loss of her family. They weren't enough to keep Mia in the town where it all happened a moment longer than she had to stay. And, though neither of them could have seen it coming, they were not enough to sustain her relationship with Adam. So Mia makes the command decision to break things off entirely and leave, leaving behind an utterly demolished and dumbstruck Adam. Over the course of the next three years, both of their lives change beyond measure, as Mia embarks on the concert career she's always wanted, and Adam is skyrocketed to stardom in a whirlwind of success and good fortune. But time catches up with them. And when they both find themselves in New York over the same 24-hour period, they are forced to deal with the detritus that is all that remains of who they once were. Where She Went is the opposite of If I Stay in every way. Where If I Stay was quiet and elegantly somber, Where She Went is chaotic and jaggedly painful. Where If I Stay was told from Mia's self-contained, removed perspective, Where She Went is told from Adam's very different point of view. And, unfortunately, where If I Stay has a breathtaking ending, Where She Went has an ending that left me with my mouth hanging open at how inadequate it was. I know it was the ending so many readers were hoping for, and the truth is I wanted that ending as well. Especially after I followed Adam around and watched with such sadness the person he had become, my heart practically bursting with sympathy for him. I loved Adam so much in this book. It's his story in every sense of things, and it's written incredibly well. I soaked up his version of events and how he never got over Mia and how all the riches life deposited in his lap weren't enough to compensate for the loss of love and friendship. Full of rage, sadness, and basically every negative, hurt emotion I can think of, he absolutely steals the show. Enter Mia and everything that has happened to her in the intervening years. I loved the setup, and I loved how it was simultaneously easy to be together again and awkwardly ruinous at the same time. From their halting physical proximity to their loaded verbal exchanges, everything was handled so well. I couldn't wait to get to the culmination of things and the inevitable decision they would have to make. And this is where we come to the inadequacy. I wanted that ending, but not this way. Not at the expense of my respect for the characters. After all of that, all of the thought and heartbreak and complexity that went into these two people who loved each other as kids and have surmounted tragedy to become adults all on their own, how could it wrap up so easily? How could either of them be satisfied with the meager resolution that was proffered? I wasn't. I wanted more for Adam and more from Mia, and that's all there is to it. All of that excruciating growth and hard-earned experience deserved more than a token apology on her part and a grateful acceptance on his. It was too fast, too simple, and too saccharine even for my romantic heart. I ended it in dismay, wishing it wasn't so. In other words--the exact opposite of how I felt at the end of If I Stay. Each reader's reaction will be different, of course (see linked reviews below). This was mine and mine alone. I'm so very glad Mia chose to stay. I just really wish I hadn't found out where she went. Thank you! I haven't been able to bring myself to pick this one up. Well, I have it on hand, but I can't make myself read it. I loved the ending of If I Stay to the point that I didn't want to know what came next. I'm going to a presentation of Gayle Forman next week, and so will probably force my decision to read or not read this book before then. I want to have read it, because I feel like there was such a positive reaction, but it's nice to read a review from someone who almost didn't want to go there either. Makes me feel like it's okay if I choose not to read it. Heidi, sounds familiar. :) I can see why people reacted so positively. Getting the ending you wanted can go a long way. And I'd certainly be interested to hear what you thought of it. Good luck deciding! Angie, I think you read my mind with this review. Really left a bad taste in my mouth after I finished it. I still enjoyed the book but I wish it had ended about 10% before it did. This is exactly how I felt about the ending! It wasn't bad by any means, but it wasn't as subtle as If I Stay. Great review. StoryLover, yeah? I'm glad it wasn't just me. I felt awfully bad about my lackluster reaction. But it just rubbed me so wrong! Terrific review! I felt the same way, although I didn't say it half as well! :--) But yes, TOTALLy agree especially with the sentence " I wanted more for Adam and more from Mia, and that's all there is to it." I too felt for Adam so much and just couldn't get over what had happened to Mia. As you say, where did she go?!!! Nevertheless, I actually liked this sequel even better than the first. See, I really felt so cheated on Adam's behalf. He deserved more after all that. I saw where Mia was coming from, I really did. But given her actions, I just didn't believe what she had to say at the end. Not a bit. Everything leading up to that was awesome, though. I really loved this review. Granted, I've only read If you Stay. I feel really bad though because I didnt particularly care for it, I want to read it again though because I think it may just have been the mood I was in at the time. I dont know if I'll end up reading Where she went because I didnt like Adam that much and dont know if reading a book in his point of view will either a. annoy me or b. make me change my mind about him. Hmm... I'll see how I'm feeling after re-reading the first one. Again, great review especially loved how you ended it with the book titles, that was clever. Aww, I'm sorry the ending didn't work for you. You did a great job of explaining why, and I understand your reasons, though I agree with rhapsodyinbooks' last statement - I enjoyed this more than If I Stay. Just really, really did not work for me. Glad it came through why. It felt like a happy ending, but not the right one. Though I understand how difficult it must be to come up with another perfect ending after the one in IF I STAY. I'm so glad to see I'm not the only person who wasn't in love with this book! My feelings still differed a little from yours though. I kept see-sawing between feeling sorry for Adam (because dumped without a word must be AWFUL, especially after everything Mia and Adam went through) and being annoyed with him (for letting his anguish over Mia take over his life so much; maybe I'm being callous, but three years sounds like a lot of time to at least grab SOME control over your life after reeling over such a breakup). The ending drove me bananas too, with how readily Adam was willing to take Mia back. Actually, I was annoyed overall at how much Mia defined Adam: when he isn't with her, his life is in shambles, but as soon as they're back together everything is AWESOME I find that kind of dependency kind of troubling. Intoyourlungs, phew. It did seem to take the reading world by storm, didn't it? Adam really was all over the place in this one. I can see see-sawing emotions with regard to him. I understand where you're coming from completely. I ended up sitting firmly in the feeling for him camp. Could have been how happy I was to be in his head and hear it all (and all the fallout) from his POV. Excellent point, btw, about how she defined him. Not good. Not good at all. So interesting to read your review. I actually had a few months between reading the first and second books and I think I am glad of that because my emotions weren't as raw from the reading of If I Stay as they would otherwise have been. I loved the rawness that we saw from Adam in this book. His emotions and actions made absolutely compellig reading. There was never really going to be a different ending, unless there was a third book forthcoming, so it didn't bother me that much. I am looking forward to reading whatever Gayle Forman comes out with next. She has set the bar high for herself! Marg, I wonder if that would have made some difference for me. The rawness was my favorite part about this book. And Adam. He was brilliant, I thought. Which is why I reacted so negatively, I think, to him just being okay all of a sudden after Mia's comparatively (in my mind, at least) WEAK apology/explanation for the years of torment. Katie, that's good to hear. The overwhelming positive reaction does make me feel like I'm nuts for being dissatisfied with the ending. But I do like the thought of them continuing to live their lives somewhere out there. I think it rubbed me wrong because the hopeless was so authentic here, but the happiness was not. 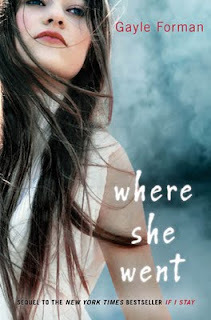 I didn't love Where She Went as much as If I Stay, but I did feel Adam's pain all throughout. I sorta wish that this story had been about another couple because, after If I Stay, I could not believe Mia and Adam turned out the way they had. Totally heart-breaking! And is it bizarre to say we thought the end of WHERE SHE WENT was actually the heartbreaking one? Because you hit the nail on the head. That's how I felt about it. Great review! Though I actually enjoyed this one more than the first, I absolutely see where you're coming from. I found the ending a little "easy", too. Kay, I'm glad you did. It deserved to be enjoyed. Too pat endings just happen to be a pet peeve of mine. At least after a theretofore serious book. Probably the only review I've read that didn't give it a million stars or think it was awesome. A great analysis, thank you! I think I know what you mean about this. I was also conflicted as to how I should rate this. Yes, that's the ending I wanted, but it felt a little too...easy? Is that the word for it? Anyway, thank you for sharing your thoughts on this. Steph, so hard to rate this one. I know. I may have been harsh. But harsh was how it left me feeling. Easy is the word that came to my mind. After inadequate. I didn't read your review past your opening paragraph because I literally just brought this home from the library today... over a year after reading IF I STAY. I'll be back after I've finished it. Christine, just as well. Don't want to taint your reaction in the least! Let me know. I felt exactly the same way - that ending was just weak.